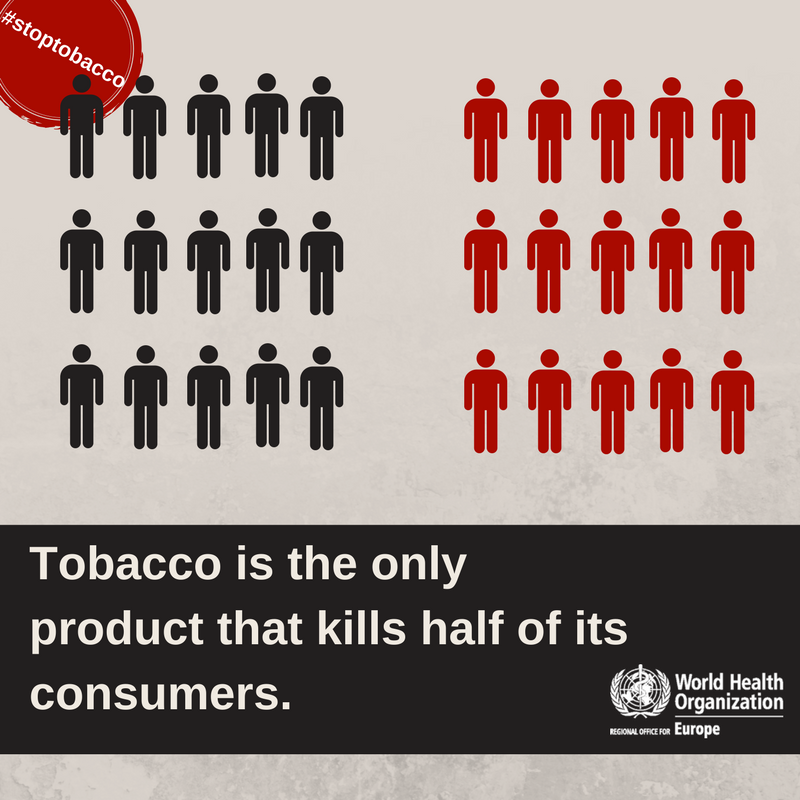 Tobacco is the only product that kills half its consumers. That tobacco kills half its consumers. That no other product does this. Perhaps both claims deserve scrutiny, but here I wish to examine only the first. Now while it's fairly easy to find reports of the dangers of smoking "even one cigarette per day," for instance, I recall reading recently that a large number (perhaps even a majority) of people who use tobacco never become addicted, even when accounting for regular social smokers (who may smoke every few weeks on average). If there are a large number of smokers who smoke, say, 2-3 cigarettes per month, then surely these count as "tobacco consumers", but would not do much to increase the tobacco-caused mortality rate. So I guess my suspicion is that there may well be a 50% mortality rate among some class of "heavy" smoker, but not among "tobacco consumers" as a whole. In any case, is this claim true, either for all "tobacco consumers", or for some smaller subset of them? I'm not gonna try to argue that "only product" part is correct, but I managed to track down where "half" statistic comes from. Tobacco smoking causes so much disease[1,2] that it is estimated to kill approximately half of its regular long time users. For overall mortality in middle age, the ratio of the all cause rate among smokers to that among non-smokers has likewise risen from 2:1 in the 1960s to 3:1 in the 1980s, and most of this excess involves diseases that are likely to be caused by smoking (table II). This means that more than half of all the deaths of smokers in middle age (plus rather less than half of those in old age) are caused by tobacco. The old statement, based partly on the first 20 years of the study of British doctors, that “at least a quarter” of all regular cigarette smokers would be killed by the habit now needs revision. In fact, the proportion is about one half (box). By coincidence, the proportion of smokers who agree with the statement that “Smoking can't be all that dangerous, or the government would ban advertising” is also about one half. Ref 2 here is another paper by Peto et al. that is unfortunately not easily available on-line (it's an old 1994 WHO Report published by, it seems), however its title matches a 1992 Lancet paper by the same authors. I guess the 1994 OUP print was some kind of extended version. The risk is great, especially among those who start smoking cigarettes regularly in their teenage years: about half of teenagers who keep smoking steadily will eventually be killed by tobacco (about a quarter in old age plus a quarter in middle age). Those killed by tobacco in middle age (35-69) lose an average of 20-25 years of non-smoker life expectancy. Nationwide, tobacco is much the greatest cause of death. In non-smokers, cancer mortality is decreasing slowly and total mortality is decreasing rapidly. Most of those killed by tobacco were not particularly heavy smokers, but most did start in their teenage years. Stopping smoking works. Even in middle age, stopping smoking before having cancer or some other serious disease avoids most of the later excess risk of death from tobacco, and the benefits of stopping at earlier ages are even greater. Not the answer you're looking for? Browse other questions tagged mortality public-health tobacco . Will a mere touch kill a butterfly? Will a worm, cut in half, survive as two worms? Was it only Johnson & Johnson which hid the link between its Talcum powder and Cancer risk?